The best part of this cheesy cauliflower loaf — besides the fact that it's low in carbs and keto-friendly — is that each floret pulls away leaving a trail of stringy, melted mozzarella. And as we all know, nothing is more satisfying than a good cheese pull. 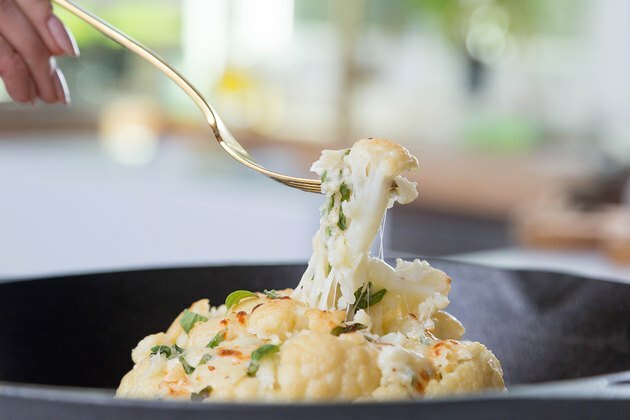 The seasoning consists of roasted garlic, basil, oregano, crushed red pepper and mozzarella cheese, all of which works down into the crevices of the cauliflower. It's like a cheesy breadstick from your favorite Italian spot, only low-carb. This easy-to-make dish provides 9 grams of protein per serving along with a much-needed dose of vitamins and minerals, including vitamins C and K. Cauliflower is also rich in antioxidants and phytonutrients that can protect your body against free-radical damage. Eating healthy has never felt so indulgent.